The Lyceum’s parking problems, arts groups salute Conrad Prebys, the Roscoe’s rumors are true and more in our weekly digest of arts and culture news. After eking its way through major budget cuts, the Port of San Diego’s public art program is finally back on track. In 2012, the Port of San Diego released its curatorial strategy, a progressive plan that laid out policies meant to guide the Port’s public art program moving forward. The strategy notably raised standards and introduced new programs like artist residencies and calls for site-specific and/or temporary work with a focus on public art that responds to the region’s waterfront environment. The days of the Port’s beloved “Urban Trees” sculptures (which were also criticized as gaudy) along the waterfront were over. But then in 2013, the Port slashed its public art budget, redirecting public art funds to help fill gaps elsewhere. Art projects that were under way were put on hold and the public never got to see the Port’s bold new plan put into place. The Port has since slowly increased its public art budget, but this fall is when things will really get rolling. Noble said folks can tap into sounds like snapping of shrimp and the pitch of the pier’s metal railings. Mixers at each listening station will allow people to isolate or add sounds. She said she hopes the experience will enhance people’s appreciation of the waterfront environment. Wise said Noble’s project is precisely the type of work the public can expect to see come out of the Tidelands Art Program, which includes in-the-works projects by artists Adam Belt, Jose Parral and Patrick Shields. She said the Port’s also rebooting “Wrap,” a temporary installation by artist Randy Walker. Each piece will still have to get final approval from the Port’s 13-member public art committee. Allowing artists to do temporary artwork, Wise said, allows them to experiment in different mediums, freeing them of the somewhat rigid requirements of working with materials that have to stand the test of time in the harsh waterfront environment. Wise said the artists who were first contracted by the Port before the budget cuts have gone back and made improvements to their projects. “In some respects the amount of time we’ve had to pause has enabled artists to think about what they wanted to do and also enabled us to do more strategic planning,” Wise said. Parking Priority for Arts Patrons? Patrons of the Lyceum Theatre used to enjoy four hours of free parking at Horton Plaza; now they have to pay $24. That’s a problem, since the Lyceum is rented by the city and meant to serve as a public theater, accessible to a diverse range of audiences and users. Larry Alldredge, managing director of San Diego Repertory Theatre, the nonprofit that manages the space for the city, told me part of the problem with the new parking policy is that Westfield, the company that owns Horton Plaza, made the change without any warning. He said San Diego Rep ended up spending about $24,000 on parking passes for attendees to the play that was showing when the parking policy changed. Alldredge said that moving forward, he’s not as worried about San Diego Rep’s patrons as he is about the other, smaller-budget production companies that rent out the space. 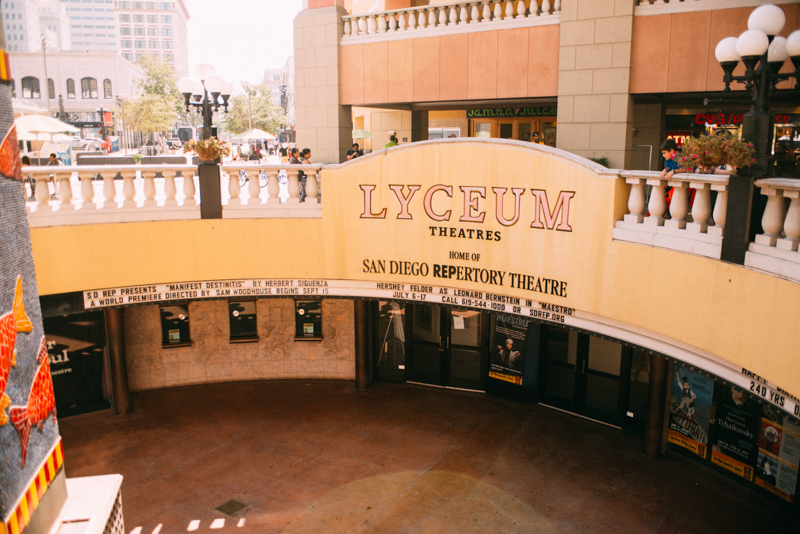 When the parking policy changed, for example, Lyceum Theatre was one of the venues for the San Diego International Fringe Festival, a collection of low-budget, experimental performances that folks pay around $10 to see. Someone who’s paying $10 to see a show is not going to want to pay more than double that to park, Alldredge said. Many of the small nonprofits that rent the space have relied on the free parking component to make their shows make financial sense. Horton Plaza says it is working with the theater to find a cost-effective parking solution. The negotiations are happening just as Civic San Diego, the city’s redevelopment agency, gets closer to wrapping up its $3 million renovation of Lyceum Theatre at Horton Plaza. • VOSD’s Lisa Halverstadt has been keeping a close eye on Balboa Park. Catch up on her latest coverage: a detailed reader’s guide explaining the Balboa Park revamp plans and a look at which Balboa Park institutions are backing the plan and those that are still on the fence. If, like me, you’re on all of the Balboa Park institution’s mailing lists, you’ve likely seen this form letter supporting the plan in your inbox multiple times. • Comic-Con happened and so did the usual flood of media coverage. Be sure to read former CityBeat reporter and certified geek Dave Maass’ list of the 25 best things at Comic-Con this year for Rolling Stone. Maass made an appearance on the VOSD Podcast last week to talk about the behemoth pop-culture convention. • The Los Angles Times details the border trek taken by Tijuana artist Marcos Ramirez, known as “ERRE,” and Arizona photographer David Taylor. The guerrilla-style art project inspired an exhibition at the Museum of Contemporary Art San Diego. The Times of San Diego previewed all four of MCASD’s exhibitions featuring binational artists. • A formerly graffiti-covered wall in Lemon Grove is now covered with a new butterfly-themed mural. • Baloba Park ranger Kim Duclo will be leading a walk-and-talk Wednesday through a new exhibition showing at the San Diego Art Institute. Here’s more on the well-known park ranger from the VOSD archives. • Hikers, take note of this soon-to-be-released new guide. • The U-T’s Karla Peterson and John Wilkens spent a day getting behind-the-scenes glimpses of a normal day at the San Diego Zoo. Check out the videos of some of those moments. • Earmilk says this San Diego rapper is one to watch. • Here’s a link to another survey, this one is by the city of San Diego’s Commission for Arts and Culture and the Economic Development Department. It’s designed to work as a needs assessment for local nonprofits that may be qualified to receive city funding. TheCommission for Arts and Culture is also hosting open office hours for artists interested in dipping their toes into the public art realm. • The Athenaeum’s “25th Annual Juried Exhibition” opens Friday. • Pokémon Go players can eat at these Pokémon-friendly restaurants. • There’s an urban agriculture fair happening Saturday. • Local roasters James Coffee Co. has a new cold brew kit for you cold-brew drinkers out there.